Bedtime can be one of the most hectic times of day, even though it’s supposed to be one of the most relaxing! I talk about sleep a lot around here because having a child that calmly and willingly goes to bed is important and can make your whole day better. When you spend the last few hours of your night fighting your kids to please go to bed, it makes for an exhausting end. If you have a little one that is like so many others and hates going to sleep, here is a new bedtime routine to try so you can reclaim bedtime! 1. Read A Story. But Not Just Any Story. 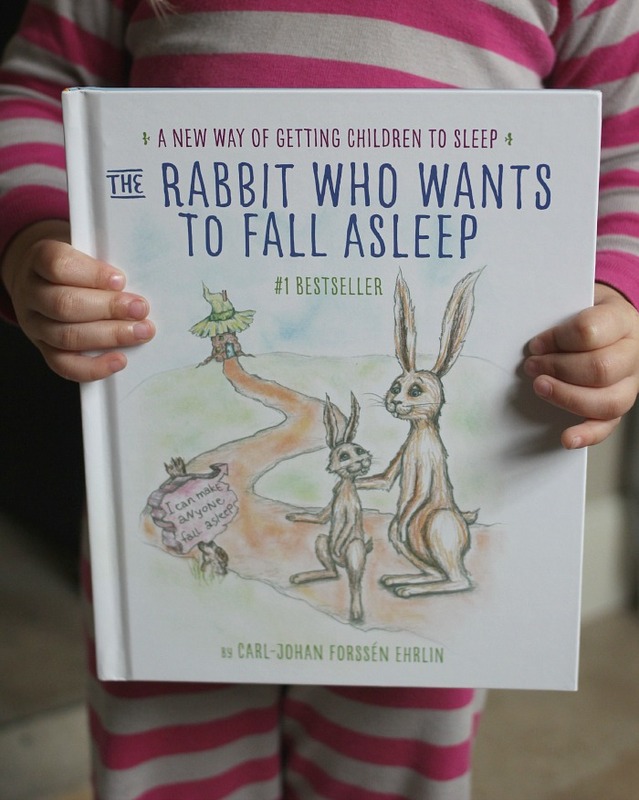 The New York Times bestseller, The Rabbit Who Wants to Fall Asleep can make a huge difference in your kids’ willingness to go to sleep. This isn’t just your average bedtime story, this story uses a distinct language pattern that helps your kids fall asleep. The words in the book encourage you to slow down, relax your muscles and let your eyelids get heavy. The story is exciting enough to keep you entertained, but not so action-packed that you’re over-stimulated. I’ve been saying this book is genius since the day it came out and I really believe that. 2. Calming Noise. I know the idea of a sound machine usually relates to a newborn baby, but I think calming noise is important for a child of any age. White noise is especially soothing, but the soft sounds of waves or rivers may work well for your children, too. I don’t like anything with actual words in it though, as I feel like it distracts and makes you focus on the music, rather than it just being a comforting background. 3. Unwind Time. It seems so obvious that having time to unwind in the evening is necessary to being able to settle down. However, we often don’t do it. The kids are still playing with toys or using electronic devices minutes before bed. I have found that having about 20-30 minutes of calmness where the lights are off and things are quiet can make a big difference in how ready they are to go to bed. This is the perfect time to read The Rabbit Who Wants to Fall Asleep. 4. A Feeling of Security. I have just noticed this recently; when my kids have some time to sit close to me or on my lap they have an easier time transitioning to bed. Here is my theory: sitting with a parent or care-giver helps them to feel secure, safe and loved which is sometimes the exact opposite of how they feel when they go to bed alone. Giving them this time before bed reminds them that they are safe. I have always been very lucky with bedtime rituals with Matthew. One thing i used to do with him when he was really little was played classical music, didnt know anything about the sound machine at that time lol. But I really think this post offers great advice to those parents who may have kids who don’t want to sleep. 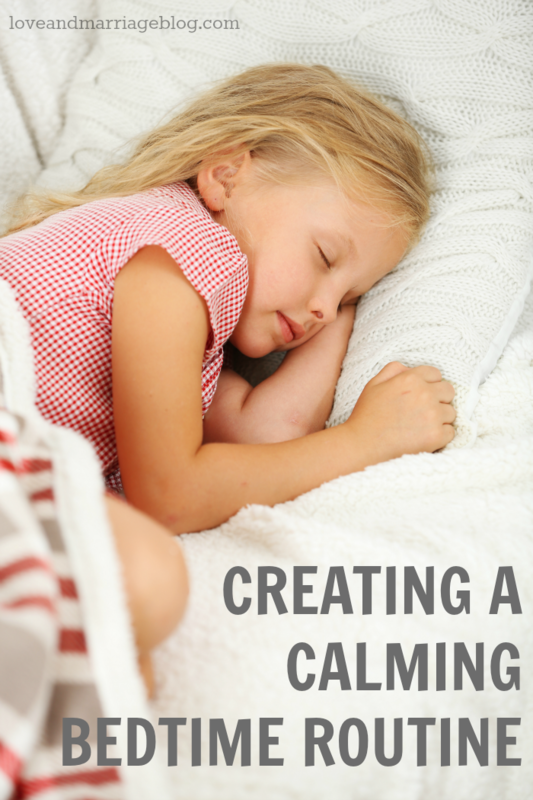 We try to do calming things leading up to bedtime- baths, stories, songs, etc. It helps a lot. We always stick to a routine bath time, stories and then quiet. We use a white noise machine and rock to sleep. We shut off the TV at least an hour before bed, play classical music and I read a bedtime story. It works every time! We would read to our kids before bed and sit in the room a while, if they were having problems with the room being too dark or they were feeling unsure or insecure. Just having one of us in the room, helped them fall sleep. Some classical music, also helped to get them to relax. Lately we’ve been using a humidifier with a nightlight inside and our child likes that to help fall asleep (the noise and the light). We also always read to her each night. A warm bath seems to help, followed by three books and a few stories about our day. My 7 year old still has night terrors sometimes. and usually someone has to lay with him until he falls asleep. My bedtime nightmare is when the kids are not feeling well! Yes, that means I can’t really get a good rest. My remedies for putting a child to sleep is reading books and singing songs before bed. We love those quiet time together. My bedtime nightmare is when kids don’t sleep through the night. Bedtime story routine helps to put my kids to sleep. My Kai is turning three December 19th 🙂 we still haven’t gotten bedtime down pat all the way. Some nights it’s easy… When she skips a daytime nap and is literally exhausted. No problem then! Out like a light. Some nights it’s harder. My bedtime nightmare is when she ends up crying and histerically throwing a fit because “she does not want to go to bed.” Hurts my heart. This is rare though. Usually, she just gets back up multiple times a turns the light back on and plays after I leave the room… Then when bored of that, opens the door and the requests begin… snacks, more water, milk, etc. it’s not so bad. I don’t mind a few final requests, But definitely cuts into my time with hubby, and really becomes a nightmare when it goes on and on and on til late. I have a lot of bedtime nightmare problems during the summer when it’s still very light out outside during bedtime. The remedies I use for putting a child to sleep are reading a story before bed and using a white noise machine. Our oldest son was very difficult to put down at night, seemed as though he felt alone. We battled for a long time and finally won! Our routine consisted of a snack, warm bath and a bedtime story. It worked and we used it when the second bugger came along! I shared on Twitter: https://twitter.com/FireRunner2379/status/669623259156103168. I am pleased to say bedtime in my household is not a nightmare usually, only when my children are sick can it become challenging. My best tip is to have a set bedtime routine and stick to it. Reading before bedtime helps to make bedtime easier. My daughter loves to read before bed. She also likes to have a “sound machine” that makes some white noise in the room. I don’t really have nightmare kids bedtime stories, but I come from a long line of very bookish people and bedtime reading is not a new concept for us. We are capable of reading as many as 5 books (or for older kids chapters from longer books) before lights go out. Nobody gets too stressed. We also don’t watch tv, ever (that’s right, not at all – some streaming, movie DVDs, that’s it) not just kids, nobody – you have no idea how it changes your life. No nightmare here, reading at bedtime works for us. we started our bedtime training when my son was 4 months. he cried for an hour!!! We have a bedtime routine now. Dinner, bath ,story time and bed time, my son goes to bed at 8 every day! my remedy is to limit screen time at least a few minuted before bed. Bedtime is not too bad at our house. We start with a bath, and that really calms him down. I think a consistent bedtime and bath before bed really helps my kids sleep well. We take a bath, read and listen to music before bedtime. Please delete the previous tweet. My children are all adults now but I remember some very difficult nights. I found that when I eliminated daytime naps it was much easier for them to fall asleep at night. We use to have a horrible time of the kids getting up over and over again but now we have a routine we stick to and that is a nice bath with lavender and then story time usually is all it takes! A warm, soothing bath right before bed always helped us. Our kids are grown now but bedtime was always very consistent and really without too much trauma! We had a very established routine that always included reading. My hubby and dog are so loud & twitchy at night, and I’m a very light sleeper! I use lavender and Peace & Calming in a diffuser along with nature sounds to help me get into a deeper sleep. I read books to my daughter to help her go to sleep, and she can not drink a lot of water before bed because she is always wanting to go to the bathroom. We also turn off the TV early so it does not bother her. Our 2 month old is already fighting sleep! A bath does help her sometimes. Bedtime is a nightmare for me and my 2 sons. I set a routine but the kids fight it and hubby does not help. I always kept my kids calm and quiet for the last hour before bed, and reading a story aloud always helped them to sleep too. The Sleep Sheep by Cloud B was very effective when my son was little. It’s a great baby shower gift! I read my son a story to get him to sleep. I hate those tornado dreams. I’ve used a fan to help drown out sound, and make it easier for them to go to sleep. I don’t have children but I remember that, when I was a kid, my mom set a strict bedtime hour and there was no budging on that, ever. She also made me sleep with the door open, so she could make sure I wasn’t in there playing. hahahah! please disregard my earlier tweet- here is corrected tweet: thank you! I use soft tranquil music and it always helps kids to go to sleep. We always had quiet time an hour before bedtime. And we would read to the kids – that always worked for us. No kids, so no remedies. They have fast LAN or DSL connections and have no idea how long their sites take to download on a 56K modem. If customer acquisition costs are bad news for e-tailers, customer retention costs should come as good news. There are actually a great many social media sites you could choose to use for building out materials. Rule(LinkExtractor(), callback=’parse_item’, follow=True),Collect and Work with PagesThe spider has a parse_item method.